Everyone reacts differently to bed bug bites but the typical reaction is small, red, raised, itchy bumps. It is important to note that roughly 70% of people do not react to bed bug bites, when first bitten. People can also experience a delay from the time they were bitten to the time it takes to react. This means you may not react to bites received until some time later. No. All studies conducted to date indicate that there is no evidence to suggest that bed bugs are capable of transferring disease from one person to another. The only source of nutrition for a bed bug is, you guessed it, blood! In order for a bed bug to mature into an adult it must feed once during each life stage. In order to produce eggs a female adult needs blood. Even though bed bugs bite humans they are not known carriers of any transmittable diseases. Bed bugs use their two elongated beaks to pierce human skin and extract blood. They use one beak to inject a saliva which contains an anesthetic to numb the area and help avoid detection, and with the other beak they extract the blood. After about five minutes of feeding the bed bug will return to its hiding place. Bites are not painful and many people will not react at all making detection that much more difficult. Some people will develop itchy red welts over the next few days. If the area becomes swollen a small red welt may appear. This welt is often itchy and can last for up to a few days. Reactions occur as a result of the saliva injected during feeding. In the case of an extreme infestation and where children have been bitten there is a chance they can develop an iron deficiency. Although some bed bug bites do not leave any marks, others can produce small red bumps or rashes. They usually do not appear for a day or two after being bitten. You should avoid scratching the area. 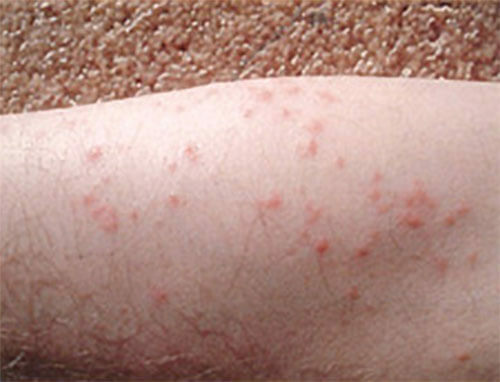 Bed bug bites are often described as resembling mosquito bites. An indicator that it might be bed bug bites is the pattern of the bites. They often occur in a group or line of three or four and are usually on an area that would be exposed during sleep. Bed bug bites do not transmit disease and will usually disappear within a few days. If a rash persists or becomes infected you should contact your doctor or a medical professional immediately.